It's official—the 2015 Badgers had the greatest offense in the Tempo Free Era (since 2002). 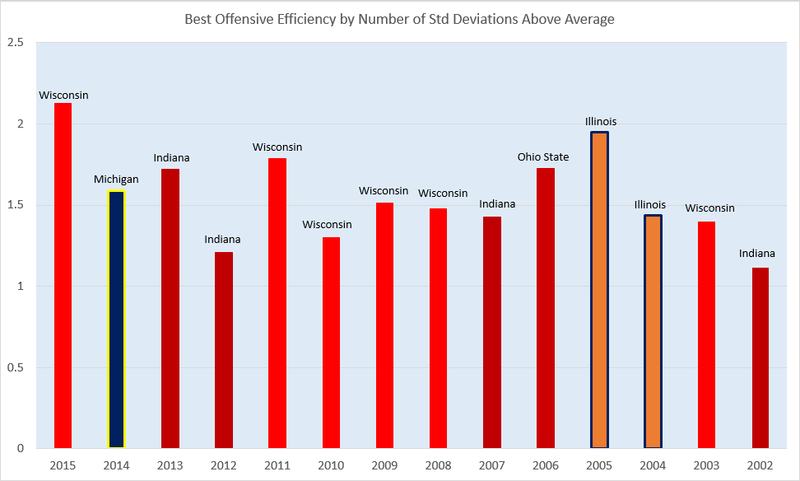 Now, Michigan fans will undoubtedly claim that the 2014 Wolverines actually bested this year's Wisconsin team in Adjusted Offensive Efficiency over the entire season. But, I would counter, that gap is very slim (much slimmer than Wisconsin's lead over 2014 Michigan in the conference season) and, more importantly, puts us in the precarious position of admitting Frank Haith presided over the 3rd-best offense in that time frame. I'm not comfortable with that. That was on Maryland's home floor. Curiously, "beating Wisconsin at home" puts the Terps in a exclusive club with one other member—Rutgers. So maybe that should not be regarded as a trump card. Maryland is now 10-0 in games decided by 6 points or fewer (yes, that's arbitrary, as any number would be. But it's at least a benchmark—two-possession game—that's tied to the proceedings on the court). Was Maryland even the 2nd best team in the Big Ten? On a per possession basis, Maryland was closer to Nebraska than Wisconsin. That's not a knock on the Terrapins, who had a fine season, but a commentary on how dominating the Badgers were this year. Back to that 10-0 mark. I think most on the analytics side would argue that random chance has a lot do to with the success of Turgeon's team in tight games. I certainly would. But I'll allow for the possibility that maybe there's just some It Factor with this year. OK, let's say there is. The problem is that even the best poker players lose a hand every now and again, because they got unlucky. And in the NCAA Tournament, you don't get to play another hand. Frankly, I'd rather be in the camp of Wisconsin (2-2 in games decided by 6 or fewer), where almost always, luck will have nothing to do with how the team won. While I'm on a roll upsetting Maryland fans, let's take on defense. UMD was, on a per possession basis, the best defensive team in the Big Ten. Or were they? Those teams in red—they only had to face the Wisconsin Offense once (or fewer). Of all the ways to praise Wisconsin's offense, this might be my favorite. As for postseason awards, I think this was an easy year for the media and coaches. Frank Kaminsky was excellent all season, and I'm hopeful we'll be able to watch him play in college for another month. Next stop, Chicago.